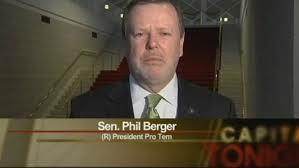 North Carolina's real bossman, Phil Berger, is obviously pissed about the evolving scandal over the private prison maintenance contract given to McCrory pal Graeme Keith's company, and he's launching an investigation. The Government Operations Committee, which Berger and House Speaker Tim Moore jointly chair, will convene a hearing on the contract on Nov. 18. The committee is calling three key men to testify: Secretary of Public Safety Frank Perry (who had warned that the contract was going to taint the governor's office), Commissioner of Prisons David Guice, and major playah Lee Roberts, director of the Office of State Budget and Management, who appears to have misled bossman Berger in getting a no-sweetheart-contract clause out of the state budget. From this N&O report, it really seems that Lee Roberts was a considerable enabler of the governor's corruption. You'll remember perhaps that Roberts, who's the son of political commentator Cokie Roberts, replaced Art Pope as McCrory's budget director.